Wow, that’s quite amazing indeed. Awesome, thanks for the info. Also Rollo is an awesome name. Great choice! A stunning scene! And I like Rollo, too. Rollo because he rolls? and pitches… and rolls… (urp!) Uh-Oh…. (runs to side of boat). I also love the ribbon of highway below the waves, leading our heroes to adventure! Is that the North Atlantic current? The “ribbon of highway” is actually Jormungandr, following along silently. :3 He loves his daddy. Thank you! 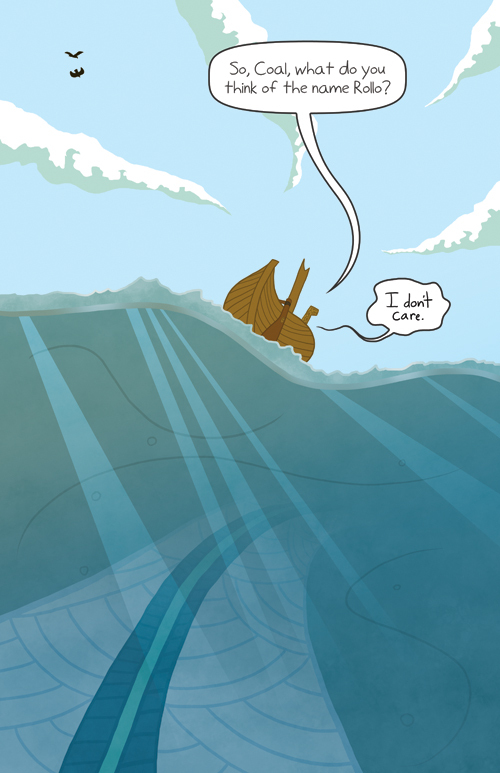 I assumed that it was a reference to “whale-road” (hron-rād), “sail-road” (“seġl-rād”) or “swan-road” (swan-rād), kennings from Beowulf referring to the sea. Haha! If you mean fanart then I’d definitely love to see it someday. If you mean something else I’m quite curious. XD Thanks! If its keeping you busy now just wait till cataclysm… which is in a few weeks. Anybody want to start playing the ‘Jaws’ theme right about now? HAHA that would be pretty appropriate. At least the thing in the water doesn’t mean them any harm. And I just noticed that our two little raven friends are still following! i think Rollo is the name of one of the boats on Deadliest Catch too. Oh? Oh! That’s even better! Hiya. I take a look at this place every now and then. Interesting comic and love the art. Haha, oh wow, hello! Man that’s been ages. XD I’m glad you’re enjoying the comic though. Thank you! I only just now noticed the big sea-snake thingie-ma-jig in the bottom! I’m amazed. Really. Everything about this comic is impressive, and I’m quite addicted to webcomics, so I guess I AM one to talk. Thank you very much for rocking so hard. Greetings from other side of lake!